We just celebrated Easter about a week ago. It was so nice, my son and his wife and daughters went to church with us and then they and my daughter, her husband and their sons came back to the house and we all had a bite to eat. The little ones were so anxious to start the Easter egg hunt! And what fun they had with that hunt! A joy to watch them running back and forth and the shouts “I got one” emanating from them. I hope you all enjoyed a similar holiday, be it Easter or Passover or your particular celebration. Spring has finally sprung and the earth is warming, trees are sprouting leaves and flowers are showing buds and blooms. It’s like a whole new beginning. The new year starts in January but for me, it starts with the renewal of Spring. Everything comes back to life. It makes me introspective. The Hyacinths are blooming in my yard, pink ones, white ones and purple ones. There are a few Daffodils about to bloom outside my office window as well. And the peepers….my lovely little peepers. The symphony they perform these Spring evenings. It is a delight of nature. I love listening to it. I am so very thankful for this new beginning, this Springtime. Sometimes I try to take a mental picture so I can hold onto it just in case I never get to see it again. Wherever you are, I hope that you are all experiencing this rebirth of the earth with all the attendant blooms and budding, sights and sounds to delight the eye, ear and mind. I wish you all the peace of a spring morning. Please take the time to really look around you and appreciate the art we take for granted every day. I hope you enjoy the newsletter this month. Please send some positive energy and/or prayers out to all the other people in the world who are having health issues and I will do the same for you. If you spend a lot of time zooming in your Excel worksheets I am sure you will agree that it becomes very tiresome very quickly! It also uses a lot of time which we all know I hate to do! So, if you have a mouse with a small wheel between the left and right mouse buttons, there is a cool little trick that you can use to do your zooming. All you really need to do is hold down your CTRL key while simultaneously turning that small wheel! Each click up or down will increase or decrease the zoom factor by 15%. Also, you can use this method o zoom any magnification between ten and one hundred percent! If, for whatever reason you would want to, if you want to zoom over 100%, you would have to use the controls on the View tab of your Ribbon. But, if you like this feature a lot and would like to use it to zoom all the time in your Excel worksheets, you can tell Excel to always use your mouse wheel to zoom. 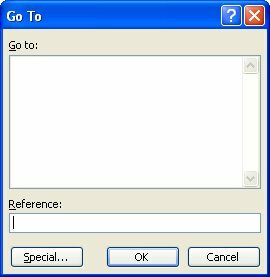 Display the Excel Options dialog box (in Excel 2007, click the Office button and then click Excel Options). In Excel 2010, Click the File tab on your Ribbon and click Options. 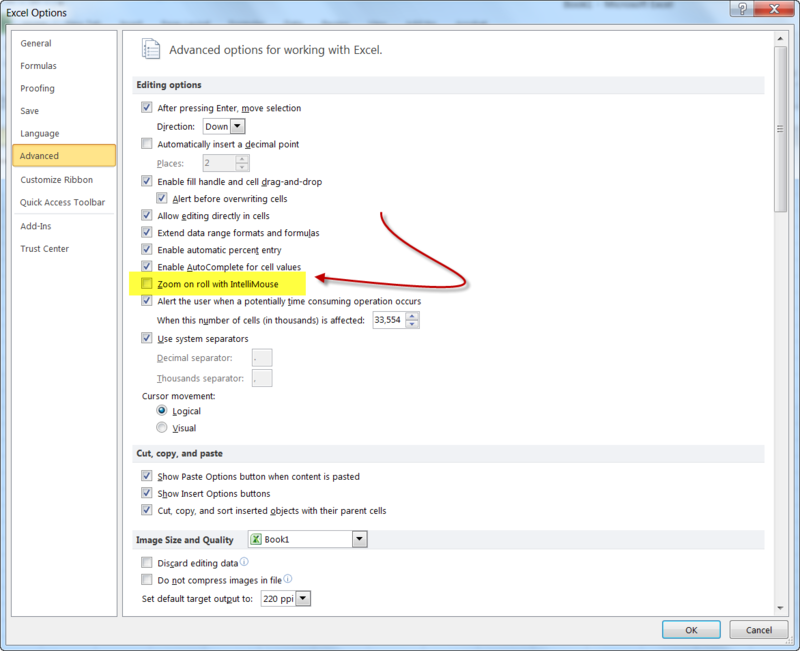 Click the Advanced option at the left-hand side of the dialog box. In the Editing area, select the Zoom On Roll with IntelliMouse check box. You can now zoom using your mouse wheel or scroll through your worksheet by holding down the CTRL key while using the wheel. 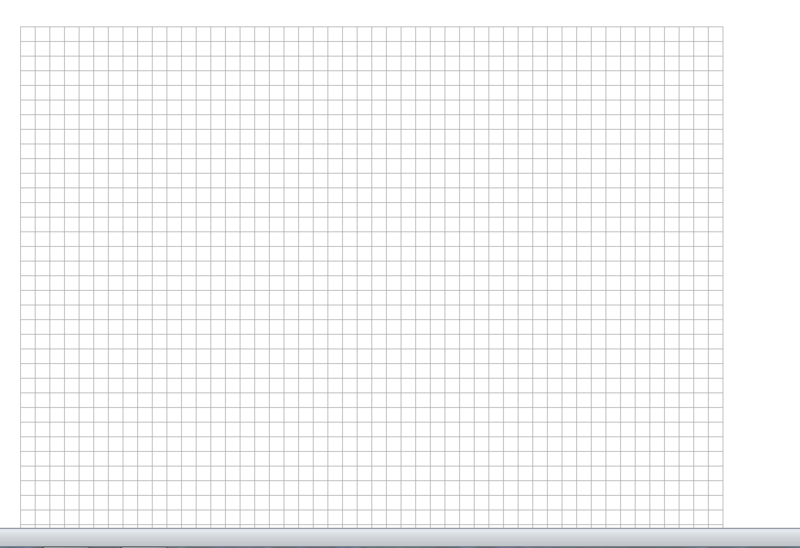 How to Get Rid of that Graph Paper Effect in Word! That’s all there is to it. Easy peasy! Excel is such a great program and it makes it so easy to hide and unhide rows in our worksheets, using the menus. What isn‘t very easy is displaying a hidden row if that row happens to be the first visible row in your worksheet. (i.e., if you hide rows 1 through 5 of your worksheet, Excel will obey your instructions). If you decide later that you would like to unhide any of these rows, however, it is not very intuitive as to how you should go about that! In the Reference field at the bottom of the dialog box, enter the number of the row range that you would like to unhide. (i.e., if you would like to unhide rows 3 through 4, key in 3:4). By the same token, if you would like to unhide row 1, you would key in 1:1. Click on OK. The rows you specified are now selected. You will not see it on your screen but they are. From the Format menu, select Row and then Unhide.